We have had this conversation for the longest time ever. Operator billing, and the role this will play in the growth of e-commerce for small goods like apps and music. Well, last night I happened to stumble on the Safaricom site on mobile and was curious as to how people purchase the products on the Wap site. I even made a purchase and downloaded a song. 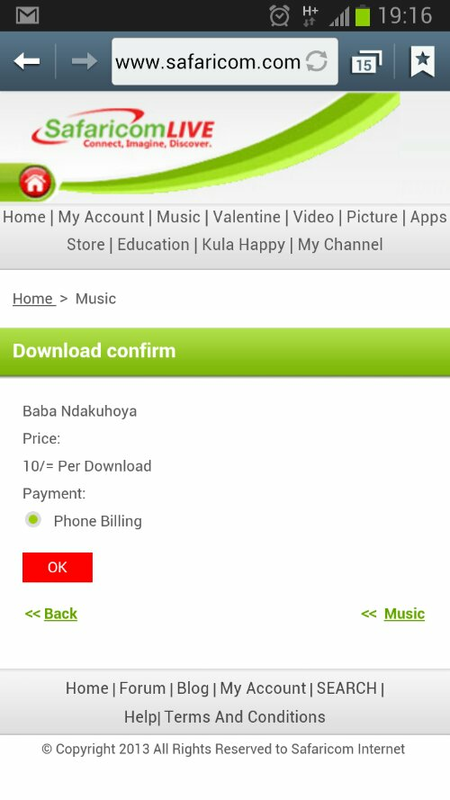 The one I downloaded here was by famous Kikuyu gospel musician Ben Githae. I was surprised that I didnt have to send an SMS to a certain number to receive the song by other tiresome means. All I had to do was click download and the option of phone billing was there as the only option. Ten shillings was deducted off my airtime and my download was immediate. I sat after the download proud that I actually did purchase a song that would benefit the singer while it wasn’t an inconvenience to me. This is how it should be. Now if only Safaricom could open up and add in other partners like applications store purchases on Android and other platforms we would have world peace. Waabeh is one application done by Kenyan developers that would actually gain from in-app purchases of the same music downloads. But let’s just wait, Safaricom may pull yet another surprise, maybe there is a reason they haven’t yet gone loud about it. this could be very useful for paying for apps, music etc downloads on the stores.I hope this is something they intend to push into mainstream and allow other service providers to use.